Brihadeeswarar Temple, is a famous Shiva temple situated at Thanjavur alias hotels in Tanjore in Tamilnadu state of India. Brihadeeswarar Temple, is a UNESCO World Heritage site and is part of “Great Living Chola Temples“. Brihadeeswarar Temple is called “Peruvudaiyar Kovil” in local language Tamil, Brihadeeswarar Temple at Thanjavur or Thanjur, is a temple built using granite in Tamil architecture by the emperor Raja Raja Chola I alias Arulmozhivarman in 1010 AD. Thanjavur alias Thanjur is famous for art, architecture, culture and religion. Brihadeeswarar Temple is one of the largest temples in India and hence called the ‘big temple‘ or ‘Periya Kovil’ in Tamil. This temple is also known as RajaRajeswara Temple and Rajarajeswaram, Brihadeshwara Temple. Peruvudaiyar Kovil was the largest building built fully with granite. 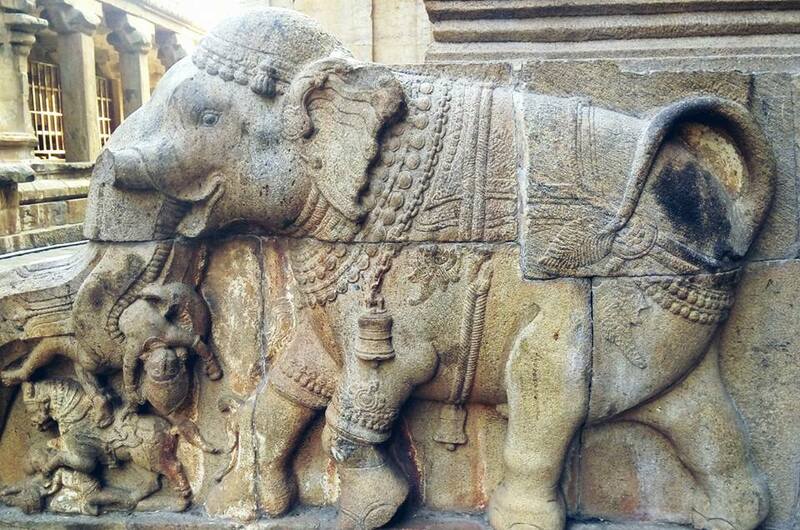 brihadeeswarar temple is built in Dravida type of temple architecture. The temple construction was completed in 5 years. The temple is at a raised height of around 5 meters from ground level. The raised platform is full of stone deities and carvings, showing various Lord Shiva dance forms. The temple tower with a height of 216 feet (66 meters) is one of the tallest temple towers. The apex or ‘Kumbam’, weighing about 81 tons is carved out of a single rock. There is a 16 feet long ,13 feet high ‘Nandi statue’ at the entrance. weighing around 20 tonnes which is carved out of a single rock. How Do I Go to Brihadeeswarar Temple alias Brihadeeswara Temple? Brihadeeswarar Temple alias Big Temple is well connected by road and railway network to other parts of the country. “Thanjavur Junction” is the nearest railway station to the famous Big temple at Thanjavur. Thajavur alias Tanjore is well connected by regular trains to Chennai, the capital city of the state. Chennai is at around 229 kilometers from Thanjavur. Tiruchirapalli Airport at around 49 kilometers distance, is the nearest airport to the temple city of Thanjavur. The nearest major international airport is at Chennai. In 2010, on the occasion of 1000th anniversary of the Temple, Goverment of India has released 1000 rupee coins with the picture of Brihadeeswarar temple alias Big Temple.